Start receiving the exam grades you deserve. Test anxious students have been found to retake standardized tests up to 3 times as often as other students. 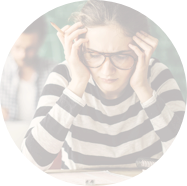 Test anxiety is simply the nervousness which people may feel before, during, and after engaging in any sort of academic assessment. A small amount of test anxiety can actually serve to motivate us as we work towards doing our best on the test. However, if you’re not mindful of test anxiety, it can hinder your performance and actually compromise your success on a test. In the end, it all adds up to low scores that you do not deserve. Overcoming test anxiety can improve your scores significantly. Our coaches have been using their expertise to help students for many years. They know what test taking skills students need in order to overcome their test anxiety. Our expert coaches use a variety of short, stress-free assessments during sessions to help you identify what will most help you to succeed before, during and after any test. Live instruction in a supportive group setting will help you to get maximum benefit out of exercises in visualization, relaxation, mindfulness, and more. Overcome test anxiety from anywhere. Our expert coaches are the secret behind our well-designed TEST-SUCCESS course. MA in clinical psychology and trained in the use of psychometrics (e.g., IQ and personality test). She specializes in teaching students who have various obstacles and impediments to learning. Taking a “holistic” approach: she not only helps them develop effective organizational habits, study skills, and test-taking strategies, but also emphasizes healthy attitudes towards academic assessment. Ready to get your best TEST-SUCCESS score?